Our darling little ice cream kiosk on the South side of the park got a major makeover earlier this summer. The sweet treats kiosk became the first NYC outpost to offer the 'Make My Magnum' experience with both custom-made and grab-and-go ice cream bar options. If you're stopping in for a custom treat, here's how it works. 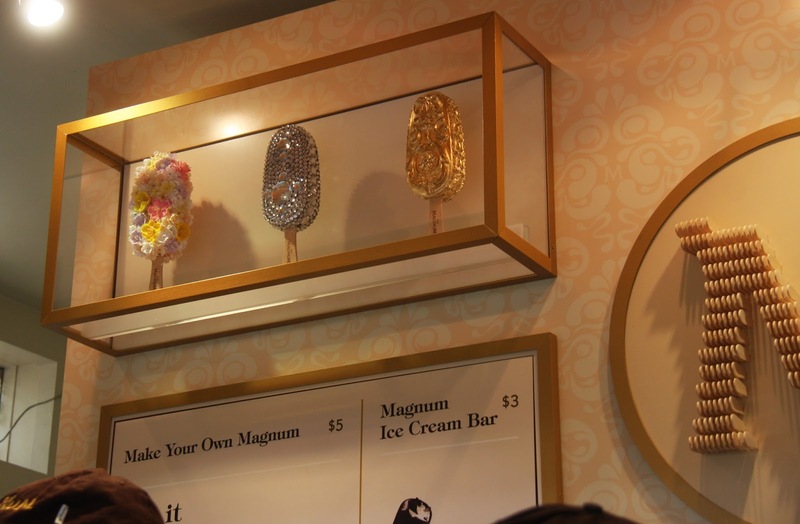 You get to customize a stick of Magnum's vanilla bean ice cream with chocolates and delicious sundae toppings. Choose from two Belgian chocolates – either milk or dark. The 'naked bar' will be dipped into this chocolate to form a chocolate shell. As this hardens, you can choose up to 3 toppings from a selection of nine add-ons. Selections have included goji berries, sea salt flakes, toasted coconut, and crushed caramel pieces. They'll shake your custom toppings in a cocktail shaker, and then sprinkle them on top of the bar. They top the creation off with a drizzle of more Belgian chocolate. Give your concoction a second to harden, and the result is pure magic! Even if you don't want to sample, stop by to see the theatrical preparation in action. There's also some beautiful details on the kiosk - a signature M made of ice cream bar sticks, model ice cream bars - ice cream really becomes an art form in Bryant Park. The Magnum ice cream kiosk is open 12:00-8:00pm Monday-Saturday, and 12:00-7:00pm on Sundays, through September 30. It is located on the 40th Street Allée, south of the lawn. Will The Magnum ice cream kiosk be open tomorrow October 1st?? Yes, it will be open until October 13th!